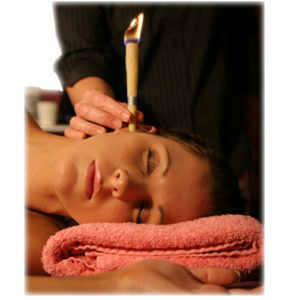 Ear Candling is an alternative medicine technique to remove ear wax and debris from your inner ear. This ancient practice can ease discomfort, improve your hearing and cleanse the sinus cavities. It also helps adults and children suffering with ear aches, candida, headaches and lymphatic congestion. As the flame burns the beeswax covered linen Oxygen is removed creating a vacuum which then draws the wax out of the ear. There is no discomfort associated with this technique.